Woman Drives Car Into a Lake, Blames GPSRecalculating route … into a lake. 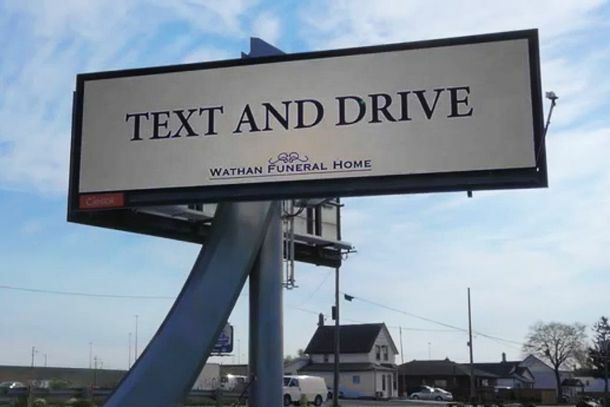 Fake Funeral Home Erects Giant ‘Text and Drive’ Billboard in the Name of SafetyHmmmmmm. Muslim Student Wrongly Labeled ‘Isis’ in School YearbookBecause high school isn’t hard enough already. Don’t Try Eating Corn With a Power Drill Unless You Want to Bald YourselfShe definitely meant to rip out all that hair. Man Breaks 120-Year-Old Statue of Portuguese Royal in Pursuit of Perfect SelfieBrutal. This Kickstarter Raised Over $100,000 Selling Nothing But Big Copper BallsPlease spend your money on literally anything else.